With the holidays looming on the horizon, stress is at an all time high. If you’re like us, you’re trying your best to get through wrapping, planning, baking, and decorating. And what better help than a calendar to keep you on track? 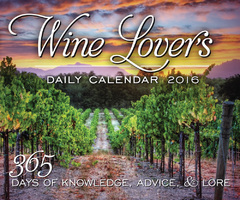 The Wine Lovers Daily 2016 Daily Calendar acts as the perfect stocking stuffer or Christmas gift, including fun facts about wine and champagne that you may not have already known about, along with a variety of quotes that can help serve as inspiration. Here’s an all-time favorite: “In victory, you deserve Champagne. In defeat you need it.” – Napolean Bonaparte (Let’s keep that in mind going into 2016). With an easy desktop layout, simply tear each page away to reveal a new picture and fact of the day. With 365 pages to get through, by the end of the year you will become a refined wine pro. And as the saying goes, ‘wine a bit, you’ll feel better’.